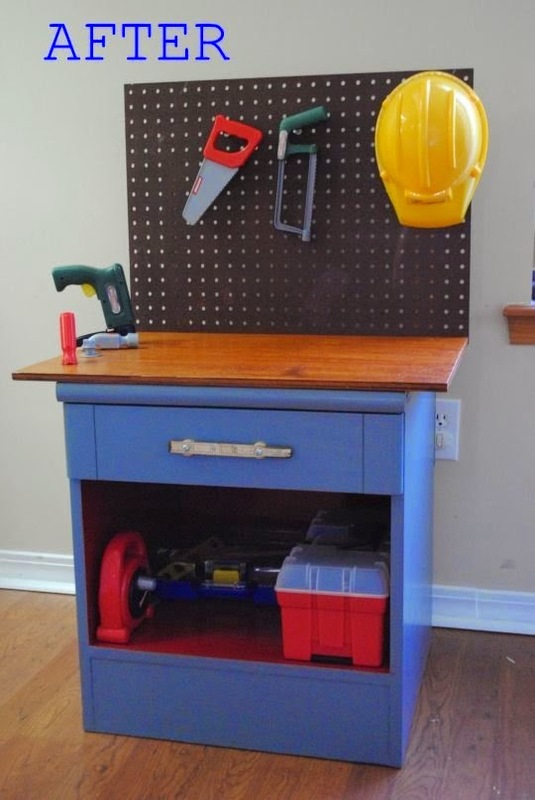 Condo Blues: Make a Play Workbench for Your Little DIYer! When you have a toddler, more often than not, you or Santa gives them a kitchen play set. I had one. It was a pink metal play kitchen. Fun fact: My first apartment had pink metal kitchen cabinets. Naturally I am pro play kitchen. I am also pro make sure it looks cool because it could show up as a real kitchen later in your kid's life play kitchen. That being the case, I am all over the upcycled furniture turned into a play kitchen. But do you know what every kid needs after they get a play kitchen? A play workbench! How else are they going to play fix the kitchen appliances? I am loving this nightstand recycled into a play toddler workbench on Apartment Therapy. It is a simple DIY that any child - boy or girl - would love to pretend tinker around the playhouse. I wish I had one as a kid!